Puppies! Take home your puppy ultrasound pictures. Advanced Care Pet Hospital has two ultrasound devices. The primary device is a Phillips HD 7 and we added a high-end portable device in 2017. The HD 7 is typically found in human hospitals. Advanced Care is one of the 1st veterinary clinics in Central Minnesota to use it for pets. The Advanced Care HD 7 ultrasound device is customized with probes and software calibrated to the smaller dimensions of pets. The Phillips HD7 provides a greater range, depth and clarity of diagnostic imaging than low cost pc or laptop based units. Dr. Gerds and Heidi comparing quality of results from both ultrasound devices. Ultrasound has several advantages to other medical imaging methods. Image visualization is real-time. Cost is substantially lower than PET scans or MRI's. It does not use harmful ionizing radiation like x-rays. X-rays are better suited to hard tissue imaging like bone structure. The goal is to find a source of a disease or to exclude abnormal pathology. Ultrasound, also called diagnostic sonography or ultrasonography is a diagnostic imaging technique using high frequency sound waves to identify abnormal pathology or a disease source inside soft tissue. Advanced Care veterinarians use a hand-held probe (called a transducer) placed directly on and moved over you pet's skin. Images are created by the "echo" of sound pulses reflected by tissue density within your pet's body. Sound echoes off tissue; with different tissues reflecting varying degrees of sound. Echoes are recorded and displayed on the device as an image to the veterinarian to interpret. Ultrasound helps Advanced Care veterinarians visualize "soft" internal organs, their size, structure and any lesions. They help evaluate tendons, muscles, joints, and vessels. The practice of examining pregnant pets using ultrasound is called obstetric ultrasound, and is popular with our clients. Perhaps its single most valuable benefit is its ability to help our doctors diagnose various health conditions, while you wait, and without the need of invasive exploratory surgery. It's used to assist with guided biopsies, or tissue collection from internal organs. Ultrasound can help us to detect cancer in its early stages. An ultrasound of the heart, or echocardiogram, is very valuable to check the function of your pet’s heart. Advanced Care provides board certified radiology central Minnesota vet clinics on a referral basis. Results are emailed to the veterinarian for interpretation and treatment. Your pets images are saved and sent to board certified radiologists saving a trip down to the Twin Cities to see a specialist. Dr. Gerds has been using ultrasound for over ten years and has had extensive training on the extended capabilities of our units. Ultrasound is recommended with all urinary tract infections to evaluate the bladder wall and to check for debris, lesions, defects and stones. Ultrasound scans are performed on-site at Advanced Care. We offer abdominal, pregnancy, and cardiac scans. We also perform ultrasound guided biopsies. Dr. Gerds can provide in-house consultations on most studies. Breeds at increased risk for congenital heart problems should have a cardiac scan at approximately six months or at the time of spay or neuter to have a baseline measurement reading and to check for early signs of problems. Chihuahua, Cavalier King Charles Spaniel, Newfoundland, Boxer, Dobermans, and Great Dane are breeds included in the list of those at increased risk. As pets age, heart valve problems can develop. Ultrasound evaluates each heart valve as well as the rest of the structure of the heart and is the best means ofdetermining the proper medications and course of treatment for the pet. Advanced Care ultrasound in action. Hypertrophic Cardiomyopathy (enlarged heart) is very common in cats and is frequently asymptomatic until sudden death occurs. We recommend periodic cardiac scans on all cats in order to catch any problems early and to be able to better ensure the safety of an anesthetic procedure. 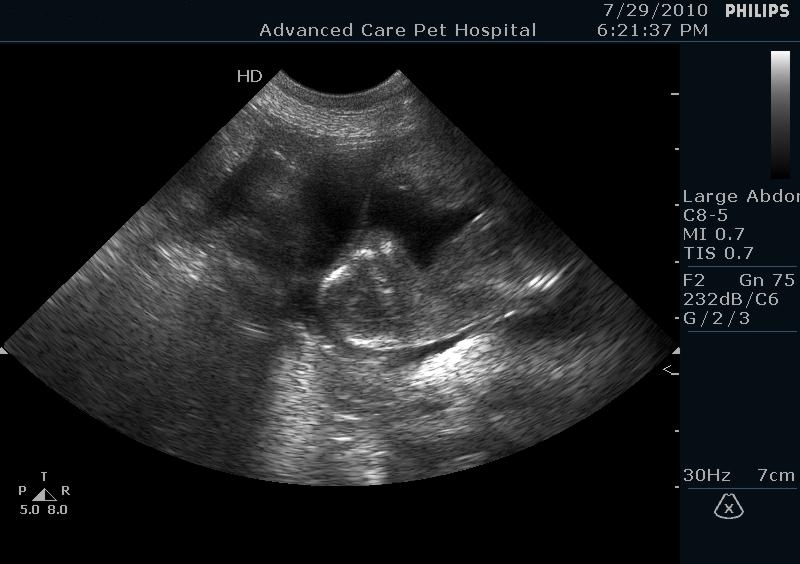 Images from your pets ultrasound studies are integrated with your Patients Records. Pets can't tell us what's wrong. Our diagnostic services provide fast results with high accuracy. On site diagnostics allow us to have accurate test results in 20 minutes instead of 24 hours. Quick diagnosis allows us to correctly we treat your pet sooner so they can recover faster. We combine advanced digital telemedicine with traditional in-house fecals, urinalysis and blood lab work, to develop a more complete picture of your pet's condition. Our ability to have results within minutes is especially valuable for pre-anesthetic testing if your pet is about to undergo surgery, as well as for evaluation of your pet if there is an emergency. Pre-anesthetic testing provides you with peace of mind and gives us important physiological information on your pet before we give anesthesia.